Yep. Another blueberry muffin recipe. Because the 1094039 paleo blueberry muffin recipes that you can find on Pinterest are not enough right? Actually, that IS RIGHT. Because those paleo blueberry muffins are not T-H-E-S-E muffins. 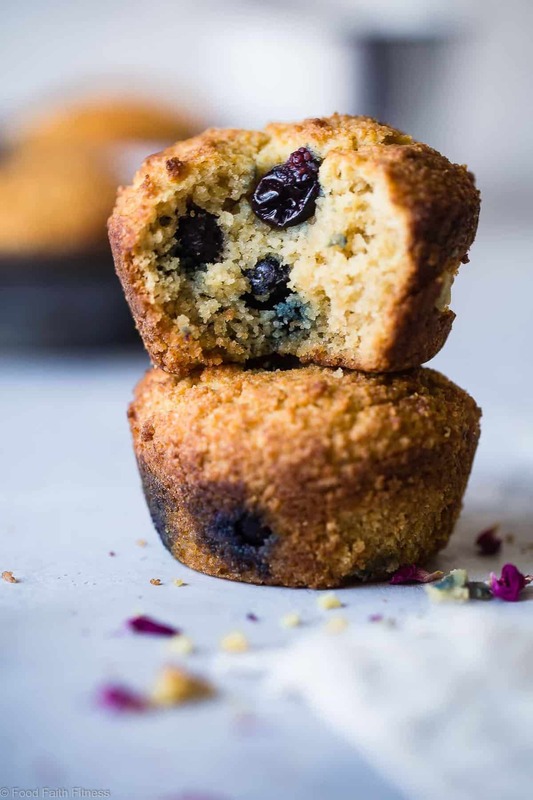 These little gems, bursting with fresh, sweet and JUICY blueberries with this perfectly lightly-crisp outside and tender, moist, yet CHEWY inside are pretty much one of the best keto muffins that I’ve made. Even rivaling the chocolate chip keto low carb muffins. I mean, truth be told, I love ALL muffins and would consider myself a muffin inclusivist. If you put oatmeal applesauce almond butter muffins, easy healthy gluten free carrot cake muffin or paleo chocolate muffins in front of me, I wouldn’t say no. But, put these? GOING. TO. TOWN. 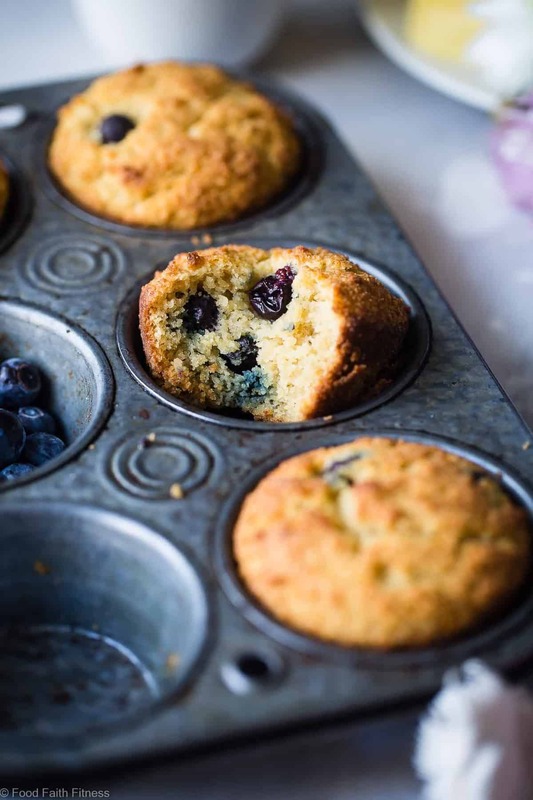 The very reason that there are 1094039 blueberry muffin recipes on the internet is because this classic little breakfast item is just SO GOOD. There’s something about the way the pops of blueberries swirl over your tongue with flecks of sweet, dough that just makes you feel HAPPY, you know? Usually I would probably explain that because, uhhhh, CARBS YO. But these SUPER moist, chewy and BURSTY blueberry muffins? Low carb! Sugar free! EVEN BETTER THAN “NORMAL MUFFINS.” <– Bold statement. But, I am feeling CONFIDENT in it. Umm. NOPE. Not what I want to hear. Work was done. Things were tweaked. There were dry-as-the-desert results. There were SO-MOIST-that-you-could-put-on-a-swimsuit-and-go-for-a-dip-results. <– do not recommend unless you want to turn blue. Maybe the blue man group would hire you though? Anyway. Then, came the discovery of APPLE SAUCE. 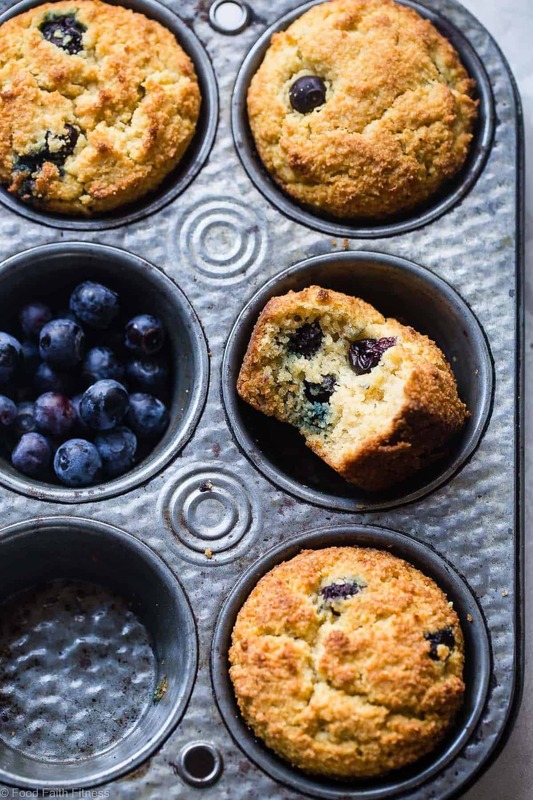 While I realize this adds a few carbs to these Low carb sugar free keto blueberry muffins , it is the SECRET SAUCE (literally) that makes these once not-so-shiny-not-so-delicious sugar free blueberry muffins a MAJOR 10 in both the yummy factor AND texture factor. Since applesauce is a natural binder, it allows us to not have to use quite so many eggs to hold these sweet little breakfast gems together, so they don’t have that “eggy-ness” that some gluten free baking does. See also: MOIST. As much as no one enjoys this word, applesauce helps keep baked goods moist, which helps offset how using natural sugar replacements can sometimes dry them out. It’s A-L-S-O adds this yummy hint of apple, and pop of natural sweetness, as your muffin-munching-mouth chews through each juicy blueberry and swirls each almond-studded bite across your taste buds. Pretty much a WIN-WIN in the grain free blueberry muffins baking universe. How do you make blueberry muffins? These blueberry muffins are SUPER easy to make! Spray the muffin pan with COOKING SPRAY. This is KEY. I tried it with coconut oil and the muffins just absorbed it all and they STUCK to the pan! Mix all the dry ingredients in one bowl, and beat all the wet ingredients in another bowl. Add the dry ingredients into the wet ingredients and stir until combined. Fold in the blueberries. Let the batter stand f0r 5 minutes. This allows the coconut flour to start absorbing the moisture! Divide them into muffin cavities. I like to try to use my fingers to evenly disperse the berries! Bake at 350 degrees for 24-25 minutes. Cool in the pan for 15 minutes, and then on a cooling rack to cool COMPLETELY! 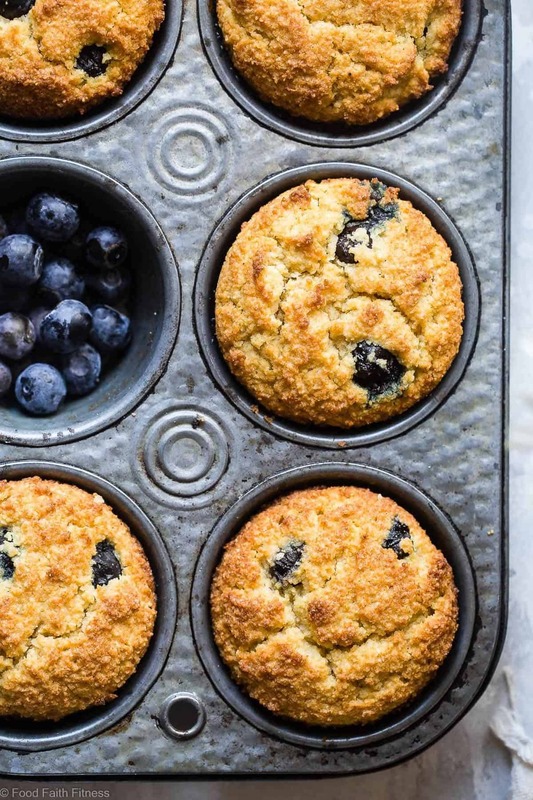 What can I use instead of almond flour to make these gluten free blueberry muffins? You can use any nut flour. 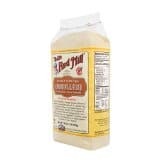 However, as nut flour is different than any other four out there, I can’t tell you have any other kind of flour would work, as recipes are tested only as written. Stick to nut flours – hazelnut, cashew etc- and you’ll have success! Even if you’re not doing a low carb diet, I can guarantee that these bites of blueberry bliss are going to make you happy and be excited to do this crazy thing that we call life. I know you probably THINK that you already have your “go to” blueberry muffin recipe, but lemme just tell you that, and I mean this in the most loving way, YOU DO NOT. That is, until you try these. 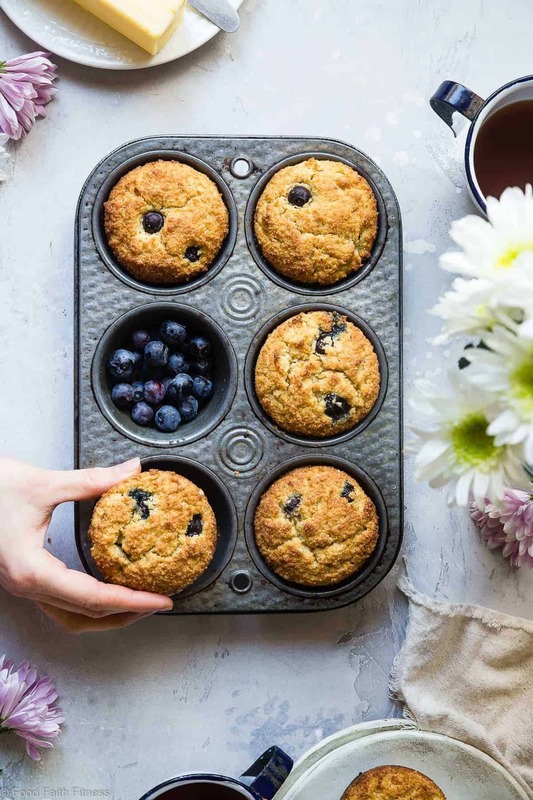 These Low Carb Sugar Free Keto Blueberry Muffins with Almond Flour are SO tender and moist you'll never believe they are healthy and gluten free! Perfect for breakfast or snacks! In a medium bowl, mix together the almond flour, coconut flour, baking powder, salt and baking soda. Set aside. In a large bowl, using an electric hand mixer, beat together the monkfruit, coconut oil, eggs, applesauce and vanilla until well blended. Stir in the almond flour mixture, along with the blueberries until well combined. Let the batter stand for 5 minutes so the coconut flour can begin to absorb the moisture. Divide by 12 muffin cavities (I like using a big ice cream scoop so that the muffins cook up with really domed tops!) and bake until very golden brown and a toothpick inserted in the center comes out clean, about 24-25 minutes. Let cool for 15 minutes. Then, gently run a knife around the edges of each muffin to loosen them. Then, let cool COMPLETELY in the pan before trying to take them out. **I like to try to use small blueberries so there is a good ratio of blueberries to batter in each muffin! ***I tried rubbing my pan with coconut oil and the muffins did not work, they stuck. So, use a spray. Or use silicone muffin pans! Just beautiful! Perfect for spring!! Looks yummy! Our son does kept. Need to show him this recipe. Definitely would like to try it. What is monkfruit? What else can I use instead of a sweetener? I need these blueberry muffins in my life! They look crazy delicious!! I think out of all muffins, blueberry are number one for me! These look so good! When monk fruit is in the recipe, am I correct to assume that is a monk fruit blend, like Lakanto? That much monk fruit would be too sweet. Thank you. They look dEEEEEEE-lishus! Spellcheck does not like me saying that but I don’t care, it’s the right word. These look so good, Taylor! 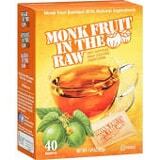 I’ve never tried monk fruit sweetener — but these look absolutely divine! You have to! It’s amazing! These look perfect. Seriously perfect!! I appreciate you effort and agree that apple sauce is a fantastic ingredient, but I’m sorry to say that it’s in NO WAY KETO! Low carb yes, but keto no. 5g net carbs per muffin is way too many carbs for a keto muffin. You should consider relabelling and not just trying to make keto recipes that are not really keto to jump on the trend. I’m sorry you feel this way Stella! Stella—I eat Keto and try to stay around 20g of carbs a day. As long as I plan ahead for those 5g, they can totally fit into my Keto lifestyle! Me too, Nicole. I stay under 20 carbs. No problem saving 5 for such a treat! I LOVE this recipe. They are yummy and fit nicely in my KETO diet. When calculating carbs, you can subtract the sugars as long as you are using sugar alcohols (like Monkfruit blend). When you subtract the fiber and sugars you get 2.5 net carbs. NOT A BAD NUMBER WHEN DOING KETO! You can never have too many blueberry muffin recipes! Blueberry muffins are a favorite, love that with these there is no guilt! Yes, these look yummy, but I was disappointed halfway through the article to read applesauce in the ingredients list. That’s not Keto approved and I can’t have that. I’m also pretty sure monkfruit isn’t keto approved. Maybe try pumpkin purée and swerve sweetener instead. Monkfruit is definitely keto approved 🙂 You can try pumpkin if you’d prefer – I am sure it would work! Ohh good idea!! I’m definitely going to try the pumpkin idea!! I can’t tell you for sure as recipes are only tested as written – sorry! My gut says to let them thaw first. Let me know if you try it! Is this 247 calories per muffin? Or for the entire recipe? I LOVE your website EXCEPT for all the popups! How do we get free of those pesty things? It’s difficult to even scroll through one recipe without so many popups. I went over to the Salad in a Jar recipes and the Walgreens popup kept coming up over and over again and hiding the recipe. I had “x” out of it so many times I finally gave up. I really want to enjoy reading your website but there’s got to be an easier way?? Hi Beje! So glad you love the website! I understand where you’re coming from! 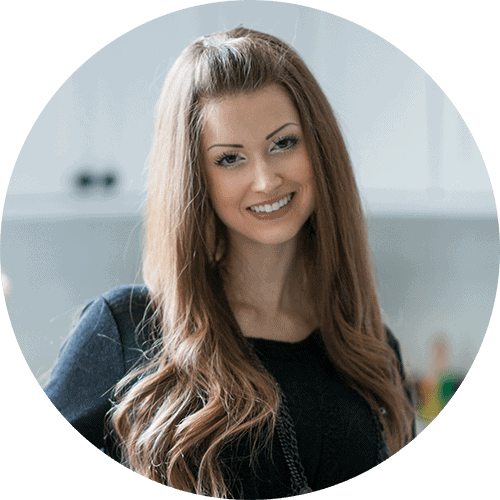 However, please understand that popups and ads help offset the very large expensive that it is to run a website and create 5 new recipes a week to share with you, all at no cost to you! Without them, I would have to charge a monthly subscription to read my blog and I am sure none of us want that! 🙂 Clicking a few x’s keeps all these recipes totally free for you! I didn’t see in the recipe how much apple sauce to add! How much do you use? What kind of spray are you using, an oil like canola? Coconut oil should work. Why all those calories? I wish you would make a pumpkin nut bread recipe for us or have you? Thank you for your testing and coming up with these delish recipes. No I am using coconut oil – feel free to try if you’d like! Hi, in the oven, batter tasted fabulously. My consistency was like cookie dough. Is its supposed to be thinner? Will see how it bakes up…. Nope! It should be really thick! 🙂 Cookie dough might be a little thick but hopefully it’s okay! Let me know what happens! They were tasty! A bit crumbly but dense and moist. Good but it looked like yours baked up lighter with air bubbles within. I realized my baking powder was out of date. I’ll definitely try them again. Maybe I shouldn’t weigh my dry ingredients! Or add more moisture? I am glad they were tasty! Definitely try with an “in date” baking powder! I definitely recommend weighing your dry ingredients! If you want them moister add a TOUCH more applesauce. Not too much though or they won’t hold together. Let me know what happens! Is there a particular brand of Monkfruit that you recommend? Ha! You can try, but I have no idea what they would taste like! let us know if you do! Made these today and they are delicious! This is the best low carb baking recipe I’ve ever made; and I agree the secret ingredient must be the applesauce. Woo hoo!!! I am SOOOO glad to hear this!!! Ridiculous! I absolutely loved these. My new favorite muffin. I used organic erythritol. Hi! Just double checking, are you using the granulated Monkfruit or a liquid version? Also, do you happen to know how this would work with Stevia (namely with respect to the conversion)? Thank you, can’t WAIT to try! I don’t know as I haven’t tried – I’m sorry! Let us know if you try! I didn’t end up trying with Stevia. BUT I used chopped cherries instead of blueberries— a fun spin, and they turned out great! Thank you for sharing this incredible recipe! Oh YUM! You’re so welcome! Glad you liked it! Why? In my research it says in really low quantities due to sugars. Pretty much half a small apple a day and in this case it’s half a cup among 12 servings. I was browsing for a keto muffing recipe and came across this one, and since I had all the ingredients I made it. They’re really good! My only tweak for next time is the salt. I questioned the quantity but decided to follow the recipe. It’s too much for my taste. Next time I’ll use 1/4 tsp instead. Still, so delicious you can’t even notice that they’re not made with regular flour. This was my first attempt at a low carb snack/treat and I was praying that it would turn out since I’m really not a great baker, plus the almond flour is reallyexpensive. ☺ But they turned out great! I made mine with no sugar chocolate chips since I didn’t have blueberries but the texture is awesome. Thank you very much! These are fantastic! I did replace the applesauce with heavy cream to make them keto and they still turned it great! Thank you! YUM! So glad you like them!!! Lindsey, did you use the same amount of of heavy cream as the same listed for the applesauce? 1/2 cup? OMG!!! I made these today. Not as pretty but really really tasty. I’m trying to figure out if it’s because I’ve not eaten anything sweet since starting keto or if they’re just that good. I think they’re just that good, and moist. I’ve tried other recipes before, and you were right, those were nothing like this. Thank you. I am SO happy that you love them! Yay! Thanks for letting me know! Thank you, for the delicious recipe!! I made these yesterday they are so moist and tasty, I love them! Thank you for all your hard work. YAY! I am SO glad you loved them! Thanks for letting me know! Not much of a cook and new to Keto. I was wondering why 2 TBS of coconut flour. Can’t I just use 2 more of almond flour? Nope! Coconut flour and almond are very different. The coconut is required to help absorb moisture! I actually changed blueberries for the keto dark chocolate chips which turned out really well! Thanks for your recipe! OH YUM! That would be SO tasty! Hi there! I found your recipe today and just made them this evening….so fabulous! I’m new to keto and wanted to know, in this recipe, what contributes to the high fat. I wasn’t expecting 21.8g per muffin. They’re so dang yummy though!! Amazing! I wanted them all for me, but the family loved them. Recipe is a keeper and now I know exactly what ingredients are in my children’s lunch muffins. YAY! So glad you loved! I made these tonight. They look and smell wonderful!! I wish I had read all the comments and substituted the applesauce with heavy whipping cream, oh well next time. I’ll be having one later. How do you store them? Thank you!!! I would store them in a sealed container in the fridge, and let come to room temp before eating! Or freeze if you keep them a long time! 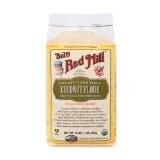 Are we able to change de coco flour for mote almond flour ? Hi there! I’m sorry you didn’t love this. Some varieties of stevia definitely have a much different taste, so you would need to play with ratios to get them right! Many people have LOVED these muffins when made as written, so I am sorry you didn’t!! I tried these with stevia and they were fantastic. Also, I used frozen blueberries. I allowed them to thaw while I prepared the dry and wet ingredients and then used some of the dry mixture to coat them. This helped them to disperse more evenly in the batter. I do have a question. Where did you get your gram to cup ratios? Every conversion chart that I tried does not agree with yours, so I find it difficult to weigh the ingredients and come remotely close to what you have. The results were still great and my husband is requesting them again today. 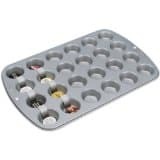 I use the grams I get in my own kitchen, from my own scale and my own set of measuring cups, not any pre-made conversion chart! All measuring cups are different, which is why I recommend following the grams! 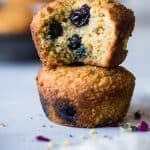 I have been ON THE HUNT for the best Keto Blueberry Muffins for 6 months (as long as I’ve been Keto) and THESE ARE leaps and bounds BETTER THAN ANY other muffin I’ve tried, blueberry or otherwise. THANK YOU, TAYLOR! Actually, we just recently returned from Seattle and the perfectly cool weather is what made me certain it was time to make these! I’m SO glad I did. I followed the recipe as posted BUT I also used frozen berries instead of fresh. I just microwaved my blueberries for 30 secs. let them stand while I mixed the wet and dry mixtures then folded them in. The muffins were truly perfect! OH YAYYYYY! I AM SO HAPPY! You just made my weekend! 🙂 Thank you, thank you for letting me know! These turn out looking beautiful! The texture is great and one muffin is very filling! I did feel the coconut oil overwhelmed the blueberry flavor. Is it possible to use olive oil instead? You can try? I haven’t tested it so I am not sure! I would recommend something with a more neutral flavor – maybe grapeseed oil? Thank you! I will try that. They are really wonderful in so many ways! Can I replace the applesauce with anything else? I was thinking of using mashed avocado? Thanks! I really can’t tell you, as I haven’t tried. However, some people have said they have had great luck with heavy cream! Made a triple batch and they turned out awesome ! Perfect texture, moisture and taste! A keeper fro sure! YAY! I am so glad to hear this! Thank you! How many of the little packets of monk fruit did you use? I didn’t use little packets so I can’t tell you. Sorry! I used the kind in big bags. While I don’t agree that these are the best blueberry muffin I have ever eaten, they are the best low carb muffin or cupcake I have found. Thanks souch for the recipe. I made them exactly as published, and while the monkfruit is pricey, it gave them a sweetness with no bitter “after”. I also enjoyed the faint undernote of coconut. Next time, I am going to mix cinnamon with sweetener to sprinkle on top before baking, as I do with my regular muffin recipes. I am going to try strawberries, also. Thanks for adding variety to my breakfasts. I am getting so tired of variations on eggs! Can these be frozen? If so, for up to how long? I’m talking about once the muffins are baked. I’m wanting to freeze half the batch for at least a week. Thank you! Also, to the person who posted about switching the applesauce to hwc, thanks! I made them as written and they were delicious but definitely not keto. I’m excited to remake them using your advice. Also, my muffins seeped so much oil. Why? I used 7tbs and they were just so oily..I will be cutting back but I’m just curious if everyone’s turned out just as oily. Hi Kat! I am sure they can be frozen but I haven’t tried so I can’t tell you for sure how long – sorry! Hope you understand! As to seeping oil, that’s odd! No one has complained about oil. Did you weigh your flour correctly? Did you measure the oil melted or hardened? Just made these and they ARE delicious! But mine did not hold together — at all! I had to scoop out each muffin tin-full into a bowl. OK, I used Swerve instead of monkfruit and replaced one cup of almond flour with coconut flour (since the almond flour is so expensive) but it doesn’t seem like that should have made the difference. I even added some extra applesauce because the batter was so dry. How did I go wrong? And should the batter look like cookie dough? which mine definitely did. I had been trying to find a good low carb blueberry muffin recipe for the longest time… I finally tried yours and am so glad I did! My husband does not like any dessert type keto stuff, but also loved these. I subbed coconut oil for butter (out of coconut oil) and my batter seemed super thick so I added 2 tbsp of heavy cream. While they browned much more than yours (the butter maybe?) they were incredible. Thank you for sharing! I am SO glad you like them! I think the browning was totally the butter! But either way, yay!!! I followed the recipe exactly, and these muffins came out just perfect! I made these because my dad is diabetic. Not only did he love them, my entire family did too. They are low carb, sugar free, no guilt, deliciousness! Thanks for such an awesome recipe. A keeper in my book! Win! YAY! So happy to hear this!! Thanks! These are the best muffins ever, nobody could tell they were sugar-free or gluten-free! Genius recipe! Wahoo! So glad you love them – thanks for letting me know! I just made these and they are the best blueberry muffins. I have ever made. I did use sugar this time but will make with the monkfruit next. They melt in your mouth. And easy to make toi! I am SO glad you love them!! Thank you!! I don’t have coconut flour. Is there anything else I can use? No I’m sorry!Coconut flour isn’t like any other flours. I can’t advise as I haven’t tried! Sorry! I wouldn’t recommend it to be honest! You COULD try flax eggs, but I don’t know how it will work/taste! Let us know if you try! So glad I found this recipe! I used erythritol because I only had powdered monk fruit, not granulated and it came out so good! I poked the blueberries into each muffin before baking instead of mixing into the batter since it was so thick, I worried that they’d break up mixing them into it. I was able to get 5-6 decent sized blueberries into each muffin and topped it off with some more batter to hide them a bit. I’ll push the batter more into the middle of the muffin next time I make them, I found that the edges got quite brown, I put foil on top to reduce this towards the end of the baking time. I can’t believe how moist these are and they don’t taste “diet-y” at all! Thank you!! Yay! I am SO glad you loved them!! Thanks for letting me know Michelle! Just made with granulated swerve instead of monkfruit. So good delicious. Not too sweet or dry. Just right! These are so good. 👍 I didn’t even use the sweetener…the applesauce was enough. I’m following the Med diet…I used olive oil. They were moist and had lots of flavor. My son & husband said they were ‘keepers’! Nice job, Taylor. Yay! I am so glad you loved them! These passed the test! My husband and daughter loved them. Their texture looked different than yours. The batter didn’t pour smoothly, maybe next time I’ll shake the pan so they are spread evenly. I’ll try less salt next time and I’m curious to try the heavy cream. Thank you! It shouldn’t be smooth – more like cookie dough! So glad you liked them! Best alternative flour muffins I’ve made so far! I straight substituted 2% plain yogurt, bc that’s what I had, instead of apple sauce and they were so good. That makes them more Keto for people… I used coconut sugar bc that’s what I like to use and it was great. I also added the zest of a lemon to the batter. YUMMY! Thank you so much for sharing! SO glad you loved them! And lemon zest is a GREAT idea! Excellent muffins,, and I’m already thinking about the next batch. I’m assuming 1 muffin is a serving. How many can one eat for breakfast on the Keto Diet. My husband is a big guy and one muffin won’t cut it for him. 1 Muffin is one serving yep! Glad you like them! I don’t follow the keto diet, so I can’t tell you for sure. Sorry! I am making these muffins today but I don’t have any coconut flour. Is there a replacement I can use. I’m sorry but it’s essential to use the coconut flour! These look delish and I can’t wait to make them. I am not on keto and I was wondering if the amount of coconut oil is just for the fat content for people on keto or if its actually necessary? Do you think I can cut back on it and maybe do half water instead? I know your recipes are very specific but I thought I would check with the pro before I mess with a good thing. Thanks so much for all your hard work and amazing recipes! The oil is really needed for taste! 🙂 Water will definitely not work as almond flour does not work when a lot of water is present. Sorry! You could TRY more applesauce? But I can’t promise it will work! Let me know if you try it though! Ahhhhh you made my whole day! Thank you! I am going to be baking these and mailing them to my daughter for Easter. They will get to her in two days. Do you think they will be ok? I THINK they will be! Of course I can’t tell you for sure. Let me know!